This quote eerily reflects the current events happening in Washington, D.C. these days. But, it was actually a radio broadcast by Winston Churchill in October 1939 regarding Russia’s involvement with Germany, a precursor to World War II. Another riddle, mystery and enigma is occurring in front of us. Escalating prescription drug costs are increasingly (and deservedly) under public and political scrutiny. The real culprit to this problem? The complex shell game being played designed to hide the insatiable appetite of greed. This complexity is hidden behind optics that appear to be driven by altruism. Each drug supply chain member claims to be performing ‘selfless’ work for the public’s well-being. But looks can be deceiving. Greed is not just limited to drug manufacturers and its trade group – the Pharmaceutical Research and Manufacturers of America (PhRMA). It’s also found with other key players involved in the supply and payment of drug products. PhRMA has been beaten up, quite deservedly, by other supply-chain players as the main reason for high drug costs within the U.S. market. But these same players are not without their own accountabilities. The other players? Pharmacy Benefit Managers (PBMs), health plans and others. When it comes to drug pricing, fingers of blame point to ‘other’ players without acknowledgment of culpability – similar behavior to a circular firing squad. The blame game is relatively easy to play when there is little transparency to provide proof of guilt or innocence. To maintain this charade of social responsibility, profiteering off those who ultimately pay the bills is the mainstay of any lobbying efforts and marketing optics. Interestingly, PhRMA came out with their own report in January, “The Pharmaceutical Supply Chain: Gross Drug Expenditures Realized by Stakeholders.” After being attacked by PBMs and other stakeholders as being the sole villain of rising drug costs, PhRMA shot back with their own tell-all study about what other supply-chain vendors are doing behind closed doors. Drug pricing, so it seems, continues to be the riddle wrapped up in an enigma. There are a considerable number of games being played by drug manufacturers, PBMs, and yes, even insurance vendors working on behalf of employers and consumers. What follows are just brief examples of worrisome behaviors found within the prescription drug pricing structure. Since 1998, PhRMA has spent nearly $3.6 billion lobbying Congress to ‘educate’ our elected officials. According to the website, Opensecrets.org, PhRMA spent $245 million in 2016 alone – almost $100 million more than the next largest sector – insurance. Despite this enormous financial ‘investment,’ the efforts have obviously paid off over the years. Drug manufacturers have been immune from negotiating with Centers for Medicare and Medicaid Services to manage their prices to a more reasonable level. They also make it difficult for Americans to purchase drugs from other countries that have more favorable pricing with U.S. drug manufacturers. Drug prices are expected to increase another 12 percent this year. Americans already spend an average of $858 annually on prescription drugs, more than twice the $400 average spent in 19 other industrial nations. To deter competition, drug manufacturers have found ways to delay generic-equivalent drugs from entering the market. A practice known as ‘pay-for-delay’ allows drug manufacturers to pay-off generic drug makers – thereby delaying the introduction of their generic brands into the market. Thankfully, this practice is declining as the Supreme Court and Federal Trade Commission push this behavior to fall under federal antitrust law. Nonetheless, drug companies are finding more ways to be creative (and profitable). PBMs exist to serve the public by aggregating drug purchasing power from payers, such as insurance companies, large and small employers and consumers. PBMs claim to negotiate the lowest price from drug manufacturers and the lowest dispensing fee from pharmacies. In return, PBMs receive their revenue primarily through rebates paid by drug manufacturers, who gladly pay to have their drugs listed as ‘covered’ under PBM’s list of approved drugs. So, do PBMs actually lower our costs? Not as much as they would like us to believe. 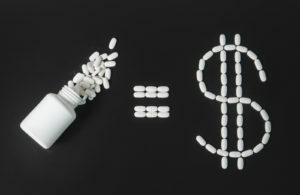 The rebate arrangement creates a perverse incentive for PBMs to dispense more expensive drugs. The largest PBMs – such as Express Scripts, CVS Caremark and Optum Rx – are incentivized to inflate drug prices because they receive higher rebates in return. Higher prices equate to higher rebates – and ultimately, higher revenues for PBMs. Local pharmacies, a trusted health provider to consumers, see their margins squeezed by PBMs, whose profits are considerably higher. 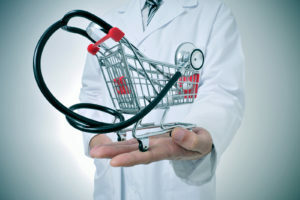 Keep in mind that PBMs generally claim 40 to 50 percent of a medicine’s list price using obscure and complex mandatory rebates – money that is not typically passed on to consumers. The value they provide to the payers is increasingly considered questionable to those who understand the entire drug pricing scheme. PBMs make more money, usually at the expense of pharmacies and consumers. 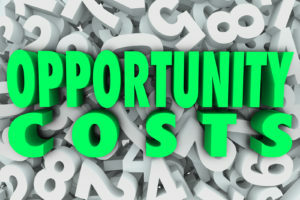 Some years ago, while I was consulting with employers on the prescription benefit programs they offered, we would often require insurance vendors and PBMs to complete bid specifications on the rebates they received and the amount of ‘savings’ they were sharing with payers and consumers. It eventually became a running joke that such a process would actually reveal honest responses, as the PBMs and carriers were under no obligation to disclose rebate practices. Insurance carriers would arrange their own special ‘deal’ with PBMs on rebate cost-sharing, and would not share their PBM contract when we pushed for proof of pass-through savings to consumers. Again, the drug pricing riddle performs famously in secret and is confusing to patients. In May 2017, Dr. Scott Gottlieb assumed his new role as commissioner of the Food & Drug Administration (FDA). He hopes to leverage his agency’s power by promoting more price competition for generic drugs. Where there are fewer than three competing generic manufacturers, applications would be pushed to the front of the line. A prime example of this is Turing Pharmaceuticals AG, which was led by Martin Shkreli, who bought the rights to sell a long-used anti-infection drug called Daraprim, raising the price to $750 a pill from $13.50. In another case, Valeant Pharmaceuticals International Inc. purchased two drugs to treat the rare Wilson’s Disease, only to raise the price by 30-fold. The idea by both organizations was to profit from having no competition. In the final analysis, much work is needed to fix a broken system. Complete transparency and curtailing conflicting interests must be addressed to solve the drug-pricing crisis that continues to haunt our country. When the truth eventually becomes apparent, PhRMA and the middlemen will reluctantly realize they are part of the problem, and subsequently determine if they can become part of a larger solution. Patient Experience: Can it Directly Determine Provider Pay? Americans are (justifiably) concerned about all three components of the Triple Aim. Yet, most of the oxygen in the room, at least in Washington, D.C., is being spent on the insurance component, which seems to ignore each of the three Triple Aim tenets. Just look at the ping-pong match happening in Congress these days regarding the repeal, replace or repair of Obamacare. Make no mistake, having health insurance allows people to seek the care they need when stricken by serious illness or injury. Without insurance, people often live sicker lives and die sooner than those with insurance. However, the insurance card that each of us (hopefully) carries merely serves as the ticket to gaining access to the movie theatre show we know as the healthcare delivery system. Without this card, it becomes progressively more difficult to navigate through this ‘system’ and receive the best possible care. Even by having this laminated card, we may unknowingly believe that we will receive the best care available at all times – a soberly mistaken myth. The quality of care that is delivered in the U.S. is uneven and, too often, inadequate. Currently, the payers and providers work with one another to determine the best way to incentivize quality care, leaving the patient on the sidelines as a confused bystander. Whether the payment approach is fee-for-service, bundled payment, capitation or some hybrid of these, the patient is not directly included in the value proposition of the care provided. Yet, it is the patient who actually receives the care, but their experiences (Triple Aim #1) are primarily presumed to be taken into account in the payment models currently used. In short, the patient’s voice is mysteriously (or purposely) missing at the reimbursement level. As a result, the deck of cards is currently stacked against the patient when determining ‘appropriate’ and ‘quality’ care. Their specific experience is rarely used, and if it is considered, it’s by aggregating the experiences of all patients for each given provider. How then, can individual patient experience determine the price a provider is paid? A new approach is to allow each patient to have input on at least a portion of the provider reimbursement. Theory from this suggests the provider will be held more accountable for the care they give to EACH patient, and possibly learn more about how to make the patient experience a more positive encounter. Here’s a simple idea that may possibly hold some water. What do patients REALLY want from the healthcare providers they hire? Quality outcomes? Crystal clear communication and instructions? Clean hospital room and/or convenient parking? Delicious hospital food? Excellent bedside manners from nurses and doctors? Providers being considerate of the time it takes for patients to receive care? The short answer is ‘yes’ to all of the above. But each patient, given the circumstances of care they receive, will make their own unique analysis of what constitutes having a positive experience with any given provider. A recent JAMA Forum article, “Payment Power to the Patients,” by Dr. Ashish K. Jha, a Harvard professor and practicing internist, provides a somewhat compelling case that the time has come for patients to jump into the reimbursement ‘game’ to determine at least a portion of pay for their caregivers. As Dr. Jha points out, assigning financial penalties or bonuses to providers based on a myriad of performance quality measures is difficult to achieve because consensus from providers and payers about how to define ‘high-value care’ is extremely difficult to determine. His approach is actually quite simple. 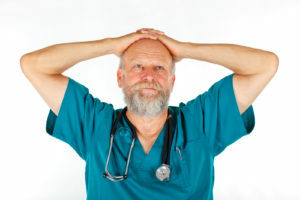 Thirty or 60 days following hospitalization, “every Medicare patient would be asked to evaluate the care they received and assign a payment to the hospital, which would determine up to 10 percent of the payment.” Jha uses the example of a pneumonia hospitalization that might have a standard CMS payment of $10,000, of which $9,000 would be guaranteed to the hospital, but 10 percent ($1,000) would be determined by the patient. Should a patient receive excellent care, based on his/her own personal experience, the full $1,000 would possibly be assigned to the hospital. Otherwise, if the patient perceived care to be below expectations, maybe only half would be assigned to the hospital. Although Dr. Jha discusses this reimbursement program through Medicare, this approach, if successful, might also apply to the private payer markets, such as individual and employer-sponsored plans. Much work would be needed for this new payment incentive system to work, however. To become more patient-centered, patients must be involved in deciding whether the care was of good quality for them, personally. The value movement must incorporate all three ‘Ps’, not just one or two. Immediate patient-experience feedback should also have direct consequences. From this, good behaviors by providers will be positively reinforced, while substandard behaviors would require modification when being identified soon after the delivery of care. As with any reimbursement method, unintended consequences could emerge. But it may be worth the effort to at least try this approach. Every day we learn of new study results that admonish us to consume more (or avoid) foods and beverages to keep us both safe and healthy. Some reports conflict with one another, causing us to become even more confused about our daily dietary decisions. For a number of years, sugar-sweetened soda had been associated with obesity, diabetes, poorer memory and small overall brain volumes. Over time, sugary soda was no longer the ‘beverage of choice’ for some. It was substituted for a seemingly more palatable option – diet soda, a sugar-free, calorie-free carbonated water with artificial-sweetened versions. However, a 2013 National Center for Biotechnology Information (NCBI) study revealed that both sugar-sweetened and artificially sweetened beverages were linked to an increased risk of developing Type 2 Diabetes. Another study, after adjusting for common factors that contribute to weight gain such as dieting, exercising change or diabetes status, showed that those who drank artificially-sweetened drinks have a 47 percent higher increase in Body Mass Index than those who did not. 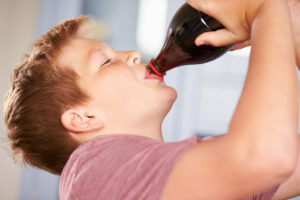 A study released in the May journal of Stroke concluded that “artificially-sweetened soft drink consumption was associated with a higher risk of stroke and dementia.” It found that those who drank at least one artificially-sweetened drink a day were 2.96 times as likely to have an ischemic stroke and 2.89 times as likely to be diagnosed with dementia due to Alzheimer’s Disease. The research, however, emphasized that it did not show causation to these diseases, only a correlation. This study’s takeaway is this: Diet sodas may not necessarily be a healthier alternative to sugar-sweetened beverages. I serve as a committee member on the Iowa Healthiest State Initiative (HSI), a statewide program whose mission is “To improve the physical, social and emotional well-being of Iowans.” As the name suggests, the goal of HSI is to ultimately “become the healthiest state in the nation.” Our workgroup is currently assessing many different healthy measurement metrics – including dietary behaviors – that will gauge the progress Iowans make when living active and healthy lifestyles. One key dietary measurement objective that we will likely pursue is decreasing the number of Iowans who consume sugar-sweetened beverages on a daily basis. As with all objectives, the idea is not to have prescriptive “Do’s” and “Don’ts” for Iowans. The goal is to gently nudge behaviors that will encourage positive outcomes for the individual’s physical and emotional well-being. This most recent study provides yet another reason to temper our thirst for sugar- and artificially-sweetened beverages. Other healthier options to these sugar-sweetened beverages? According to The Nutrition Source from the Harvard T.H. Chan School of Public Health, drink more water, tea or coffee (with little or no sugar), limit milk and dairy products (1-2 servings/day) and just one small glass of juice each day. Again, these are merely suggestions. More about the Healthiest State Initiative, version 2.0, in future blogs! Have you ever heard or perhaps experienced first-hand, that a patient was diagnosed with a particular health condition and learned later the diagnosis was inaccurate? Chances are, it’s happening more frequently than you might think or wish to accept. The somber statistics about misdiagnosis in the U.S. are both staggering and devastating. According to a 2015 report, “Improving Diagnosis in Health Care,”diagnostic errors account for up to 17 percent of hospital-related adverse effects – a horrifying number when you consider that about 35 million people are admitted to U.S. hospitals annually. For outpatient procedures, approximately 12 million will experience a diagnostic error. In 1999, the National Academies’ study indicated that 10 percent of all medical diagnoses in the U.S. were incorrect, causing 10 percent of all deaths in the U.S. In short, one in 10 patients receive treatment based on the wrong diagnosis, resulting in unnecessary surgeries, ineffective or dangerous medication, inappropriate transfusions, avoidable infections, extended hospital stays and other care deemed unnecessary. Mayo Clinic’s study, “Extent of diagnostic agreement among medical referrals,” recently found that when patients were referred by primary care practices to Mayo’s General Internal Medicine Division during 2009-2010, that only 12 percent of patients received confirmation of their previous diagnosis. 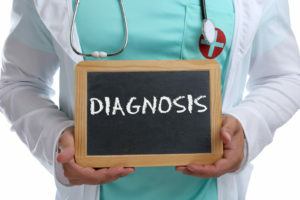 The majority of patients – 66 percent – found their diagnosis were “better defined/refined” after visiting Mayo, while 21 percent had distinct differences between their referral diagnosis and final diagnosis. This equates to 88 percent of patients receiving a new or refined diagnosis at Mayo. In order to provide effective and efficient treatment, patients must first receive the right diagnosis. As James Naessens, Sc.D., head of the Mayo research team stated, “Knowing that more than one out of every five referral patients may be completely [and] incorrectly diagnosed is troubling – not only because of the safety risks for these patients prior to correct diagnosis, but also because of the patients we assume are not being referred at all.” Not receiving a second opinion proves to be both expensive and potentially deadly. Importance to Employers & Payers? Why should this matter to employers and other payers? In addition to the human cost of being misdiagnosed, the costs can be a major contributor to approximately one-third of the healthcare waste estimated annually – amounting to $1 trillion. In the final analysis, each and every one of us need to be vigilant about the care we receive. Our lives just may depend on it. High-Deductible Health Plans – A ‘Silver Bullet’ for Healthcare? My family has been enrolled in a qualified high-deductible health plan (HDHP) for the past eight years. During each calendar year, we are responsible for paying the first $10,000 of our covered health expenses before the insurance company assumes paying the remainder at 100 percent. As a ‘qualified’ plan, some preventive services are automatically covered by the insurance company without my family having to satisfy the deductible. In addition, to help offset the high deductible each year on a pre-tax basis, we have a health savings account (HSA) that we fund annually up to inflation-adjusted contribution limits – which is $6,750 for 2017. About one-third of American workers now have HDHPs. HDHPs and HSAs, collectively known as consumer-driven health plans (CDHPs), are considered to be important components in most every Republican replacement plan that is being bantered around in the public – mostly used as talking points to control future health costs. CDHPs, we learn, allow Americans to become better ‘consumers,’ rather than merely ‘users’ of care. Advocates also believe that by having more ‘skin in the game,’ we become better consumers and are not as inclined to utilize more care than necessary. Finally, patients with high-deductible plans will scrutinize costs by reviewing alternative care options within the marketplace. 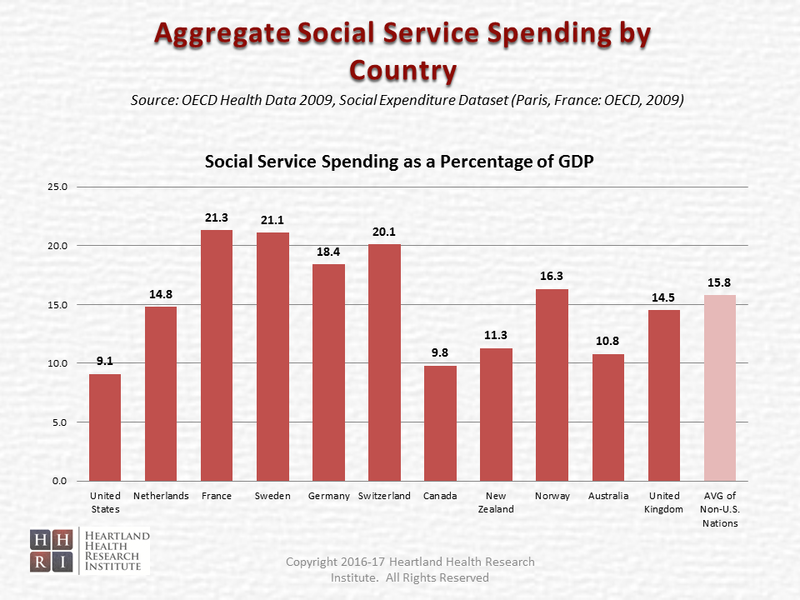 Doing so will ultimately squeeze costs to becoming more affordable. When allowed, market-driven approaches can work quite successfully. Look at the electronics world in which we live. We are paying dirt-cheap prices for products that have higher quality components with a myriad of enhancements that were not even on the drawing board over 40 years ago. For example, in 1970, a new 25-inch diagonal Cinema Screen Color Television (with remote) cost $739.95. At that time, this was the largest screen available in TVs. Today, you can visit the nearest store (or go online) and purchase a 32-inch LCD high-definition TV with numerous enhancements for as little as $150.00. Today, thanks to a robust market that allows for transparency on price and quality, any motivated consumer can spend hours analyzing innumerable televisions that can be purchased through legions of vendors. But this can only happen when the market allows buyers to discern both price and quality from many sellers to determine the value they wish to pay for. But when it comes to being a savvy healthcare consumer, even when armed with a CDHP, Deb’s enthusiasm to discern value diminishes greatly. In addition to navigating through providers for her own needs, Deb is often involved with assisting our two college-age daughters with doctor appointments, prescription drugs, and many other coordination efforts that sometimes appear to be futile. One daughter has been recently diagnosed with idiopathic hypersomnia, a sleep disorder in which a person is excessively sleepy during the day. Unfortunately, there is no clear cause for this disorder, and little is known about effective treatments. As parents, we can only hope to do our best at finding providers who listen, demonstrate empathy, and act as professional surrogates in making sense out of the senseless. Deb has never been a big fan of our CDHP, largely due to the lack of price and quality information available that would allow her to perform her consumer magic. If any family could navigate through the healthcare system, you would think that an insurance/healthcare research professional and his attorney-wife would be successful. In our existing healthcare world, however, any successes we have are usually small and short-lived. It is extremely hard to be a healthcare consumer in Iowa – or any other state, for that matter. Admittedly, healthcare is not a homogenous commodity, nor is it ubiquitous. But even so, good luck figuring out how much a visit to a specialist or receiving a minor surgery will cost. The insurance tools available to help navigate our care are, at best, similar to playing a game of horseshoes – “close enough” is the best we can hope for. In healthcare, having precise data to make important life decisions remains only a hope. For the short term, I’m not as optimistic about high deductible health plans that are coupled with health savings accounts. Afterall, delayed care is the most often-considered tool that we have – which may or may not be a good thing. Long term, we will just have to see if our healthcare system can begin to resemble a true market-driven world that allows for innovation and make the Debs in our world happier and more consumer-savvy. In the meantime, we will need to be content and enjoy our wood floor and high-definition television. 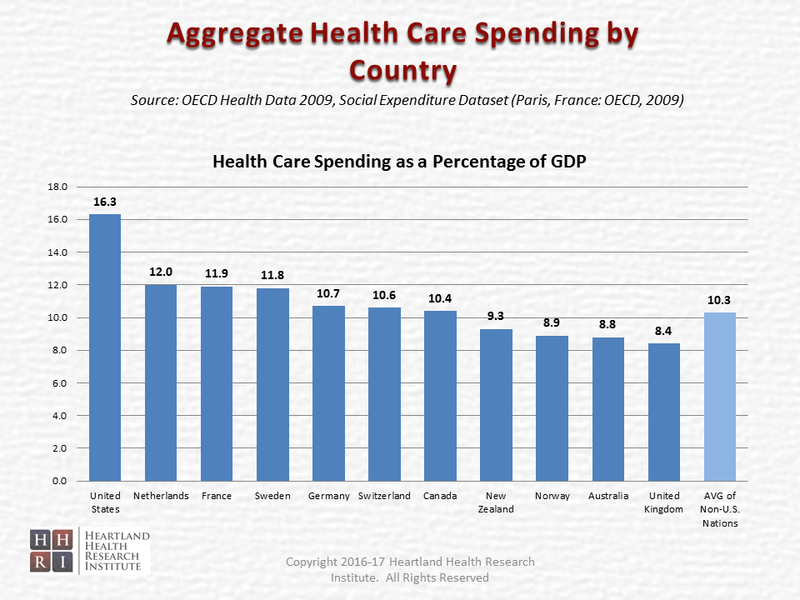 We know that healthcare spending continues to grow at an unsustainable rate. Each election cycle, we expect policy makers to find meaningful ways to slow that growth and ultimately reduce spending – while maintaining quality and access. As mentioned in our previous blog “Time to Move Upstream and ‘Invest’ in our Health” co-authored with Dr. Yogesh Shah, the prudent approach is to simultaneously move upstream and address the social determinants of health. This thinking might sound ‘pie in the sky’ to some, but controlling costs cannot happen without addressing the environment in which we live, learn, work and play. Failures in Care Delivery – poor execution or lack of widespread adoption of best practices, including effective preventive care practices or patient safety practices. Failures of Care Coordination – Fragmented and disjointed care of patients when transitioning from one care setting to another. Overtreatment – Care that ignores scientific findings, perhaps due to outmoded habits. Defensive medicine is an example, such as unnecessary tests or diagnostic procedures to guard against malpractice lawsuits. Here is just one example. Administrative Complexity – Having multiple ‘administrators’ with divergent protocols and practices, such as the government, insurance companies or accreditation agencies who create inefficient and overly bureaucratic procedures. Pricing Failures – This waste is baked in to our healthcare ‘system’ because the price of a service exceeds what would be found in a properly-functioning marketplace. In healthcare, we lack appropriate competition at the right levels and have little transparency on cost and outcomes. Fraud and Abuse – This is the cost due to fake medical bills and scams, in addition to the cost of inspections and regulations to thwart any wrongdoing. Based on the population of 3.033 million Iowans in 2009, the cost per capita in Iowa for healthcare was $6,921, totaling almost $21 billion. The largest portion of this cost comes from hospital care, which consumes about 39 cents of every dollar spent on healthcare ($2,713 per capita). This amount includes the total net revenue (gross charges minus contractual adjustments, bad debts, and charity care). Assuming the midpoint waste average in Iowa is 30 percent, and we have little reason to believe it is measurably different from national norms, the total annual amount considered to be wasted on hospital care would be $814 per Iowan. Using a similar waste factor of 30 percent for each of the nine health components, the total waste per capita would amount to $2,076 (see graph below). 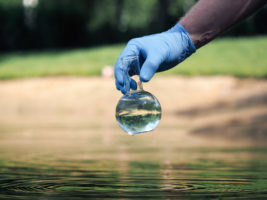 Because many of the components are interconnected with one another, it is extremely difficult to cull out the actual waste factor within each component. Some components may have much lower inherent waste, while others may not. Costs such as insurance program administration, research and construction expenses are not included. 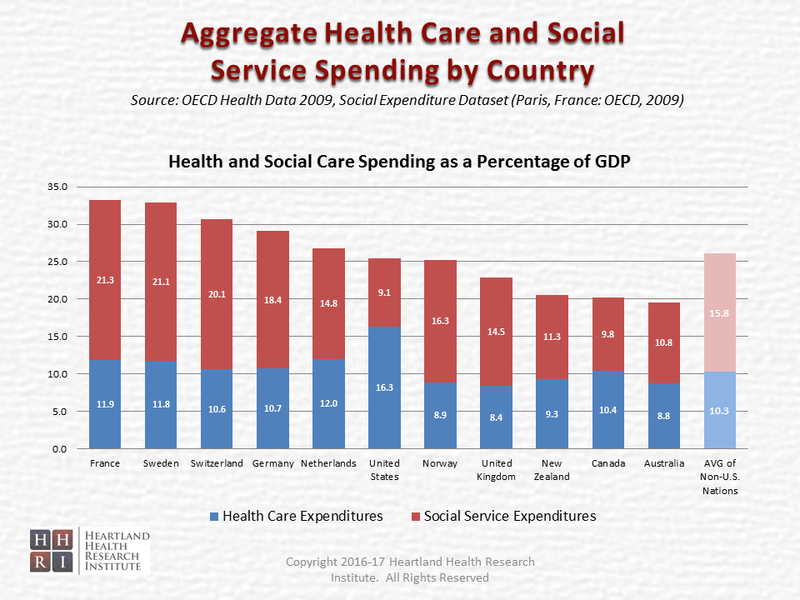 The following graph provides the total healthcare costs (in $) for each of the nine components, in addition to the potential wasted spending. 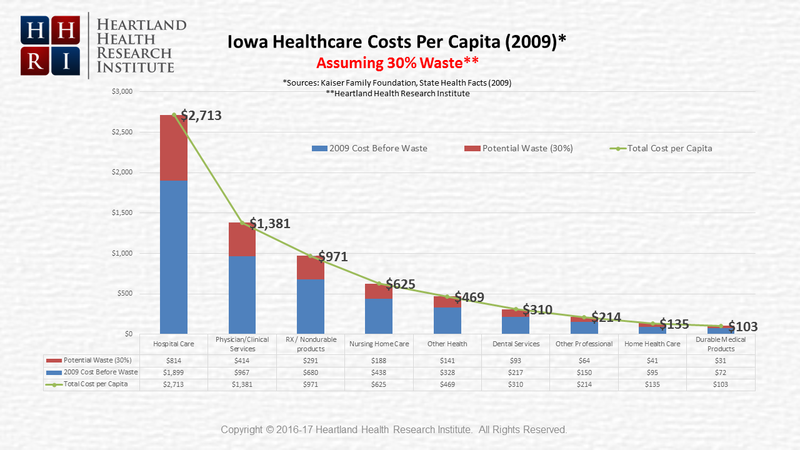 Again, using hospital care as an example, if 30 percent of waste was eliminated in Iowa hospitals, the price tag could have dropped from $8.2 billion to $5.7 billion – resulting in a $2.5 billion ‘savings’ – or unnecessary overpayment. Most Americans detest waste – especially when it affects our pocketbooks and the potential impact it has on our health and well-being. Waste is anything that doesn’t add value to the end product. In manufacturing, waste can be rooted out by using different proven programs, such as lean manufacturing. Doing so allows the manufacturer to build higher-quality products at a more competitive cost. The same process can be used in healthcare. Having the right kind of incentives to change the willpower and behavior of those providing (and paying) for this care, is crucial. This list represents just a small sampling of social determinants that eventually affect the healthcare we pay. By smartly eliminating waste in our healthcare system, and thoughtfully re-directing the ‘savings’ in areas that matter most to our communities, we can further stem our healthcare-cost epidemic. Imagine the sizeable dent we make in our communities by culling out billions of dollars annually from the waste we pay. The discussion of displaced healthcare jobs and the potential ‘economic impact’ requires further exploration in a later post. Following the election, we will continue to debate the fate of Obamacare – who will pay and how much – but this discussion is being made with greatly inflated dollars. We would be well-served to dedicate equal energy to squeeze the waste from healthcare and redirect resources to benefit our communities. We know the waste is there. But what about our willingness to eliminate it?